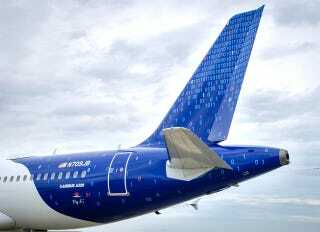 JetBlue is introducing a new binary-themed livery on N709JB, one of its Airbus A320 aircraft. Featuring a dark blue aft fuselage with zeroes and ones, and named "CONNECTED TO 01000010 01001100 01010101 01000101" — binary code that translates to: "Connected to BLUE." In December, JetBlue launched its "Fly-Fi" product, which is their version of the WiFi / streaming entertainment package. The airline says they currently have 37 planes in the fleet equipped, adding 10 planes each month to the system. Full completion is expected by the end of this year. Right now, passengers can use the "Simply Surf" web browsing option for free during the beta test, which runs through June. A higher bandwidth "Fly-Fi Plus" option can be purchased for $9.00 per hour. "This beauty of a plane truly represents the pride we have in providing our game-changing Fly-Fi service. We recently saw a record 136 connected devices on one of our flights — all enjoying a great high-speed connection. We've never seen anything like that from other inflight Wi-Fi products!" Once upon a time... we set out to the find the best onboard Internet available, but nothing we saw was good enough. All the technology was too slow and often too costly for customers. Seems fair enough. After all, it's an incredibly expensive long-term commitment to install these things on every plane in the fleet. For example, Gogo's contracts last 10 years in most cases. Their first one expires in 2018 with Alaska Airlines, leaving some wondering if Alaska will re-up with Gogo, possibly upgrading to their new 2Ku service announced last month. 2Ku promises speeds of up to 70Mbps. By the end of 2015, a new AT&T 4G LTE system is expected to be up and running for airlines, so that may be enticing as well. JetBlue says they have partnered with their friends at LiveTV - which was owned by JetBlue until March of this year, before being sold to Thales of France. LiveTV has been the source of JetBlue's onboard entertainment for years. The newest incarnation - LiveTV 4.0 - will give passengers a 10.1 inch screen on which they can watch over 100 channels of live DirecTV programming. Passengers in JetBlue's posh new MINT business class will get 15.6 inch screens. It will be found only on JetBlue's transcontinental Airbus A321 flights. MINT debuts in June, and I'm hoping to provide Flight Club with a hands-on account of it, once it rolls out.